The water level issue is turning into a problem. The National Weather Service and Army Corps of Engineers are predicting a 45,000 cfs inflow to the Rez on Friday. This prediction does not include any rain we receive between now and then (and it is predicted to rain this afternoon). According to the John Sigman of the PRVWSD, the discharge from the Rez will increase to 40,000 cfs today, and 45,000 cfs at 6 p.m. this evening. 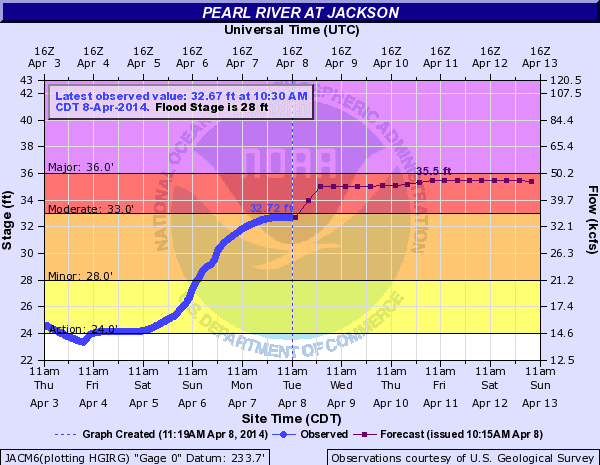 As a result, the Pearl River is predicted to rise to 34 feet in Jackson by this afternoon, and 35 to 35.5 feet later tonight. People, we are on the cusp of what NOAA refers to as "Major" (36 foot) flooding. See the chart in the post below to see what that means, i.e., water will be close to entering homes in NE Jackson. It is predicted these high flows will continue for the next 6 to 7 days. In the meantime, the level of the Rez will rise above 298 gage height, and could go as high as 298.5 gage height. The Easter Flood crested at 43.28 which is off the chart above -- literally. Additional Rain to a Swollen River . . .